The year 2014 is the centenary of Sir Ernest Shackleton's Endurance expedition, which aimed to complete the first crossing of Antarctica. He did not succeed, and his great vision rapidly turned into a now-legendary struggle for survival. 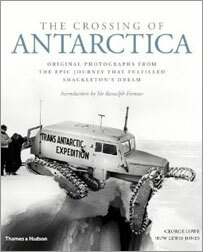 Shackleton s lifelong dream to cross the continent was at last realized by Sir Vivian Fuchs and Sir Edmund Hillary in 1957-58. As a key member of this Commonwealth Trans-Antarctic Expedition, Everest veteran George Lowe was there to capture it all on film. In this remarkable book, a trove of unpublished photographs and other rare materials from the Lowe collection are brought together for the first time. Awe-inspiring landscapes, candid portraits, and action shots evoke the everyday moments of this historic expedition as never before. The Crossing of Antarctica provides a dynamic history of the Heroic Age expeditions and the emergence of adventure photography. A stellar array of polar experts also reflects on Antarctica and the meaning of true exploration, including Sir Ranulph Fiennes, Peter Fuchs, Jonathan Shackleton, Sebastian Copeland, Geoff Somers, Ken Blaiklock, Felicity Aston, and Paul Dalrymple.